The Chilean channels are famous for their wild beauty, but for the crew of Mollymawk the scenery is only part of the attraction. For us, the history of this region is equally alluring. 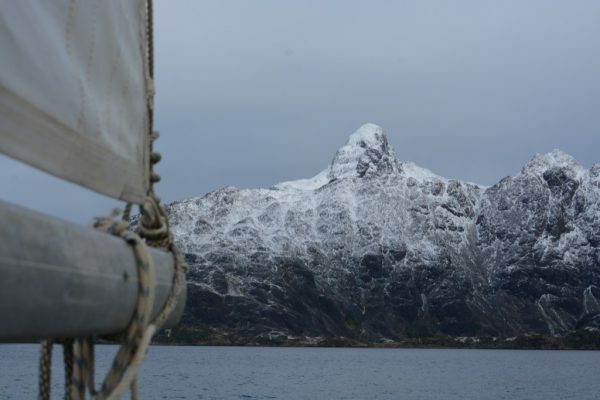 To be sailing along the route first discovered by Magellan; to be anchored in the very place where the Beagle moored; to be traversing the sound where Robert FitzRoy searched so frantically for his stolen whaleboat – for us, these things add a special dimension to the adventure. 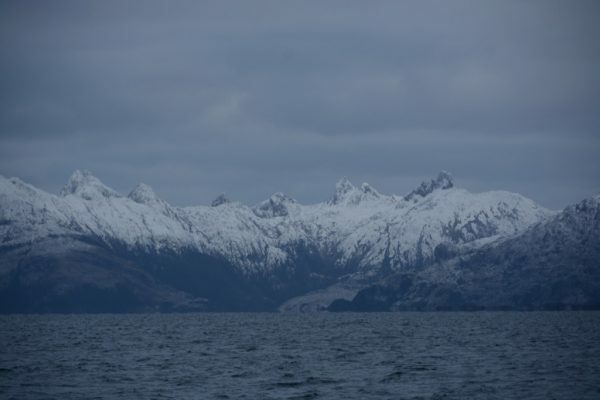 Having sailed the length of that famous channel which was named for the old sailing ship, and having had another brief look at some of its fiords and glaciers, we now continued westward towards the Pacific. We were travelling precisely in the wake of FitzRoy, but whereas we had the luxury of a heated cabin and the comfort of knowing that there was a safe anchorage at the end of the day’s journey, the young explorer and his companions were making their journey in an open dinghy some twenty-five or thirty feet long; and they had no idea what the day or the night ahead might hold. 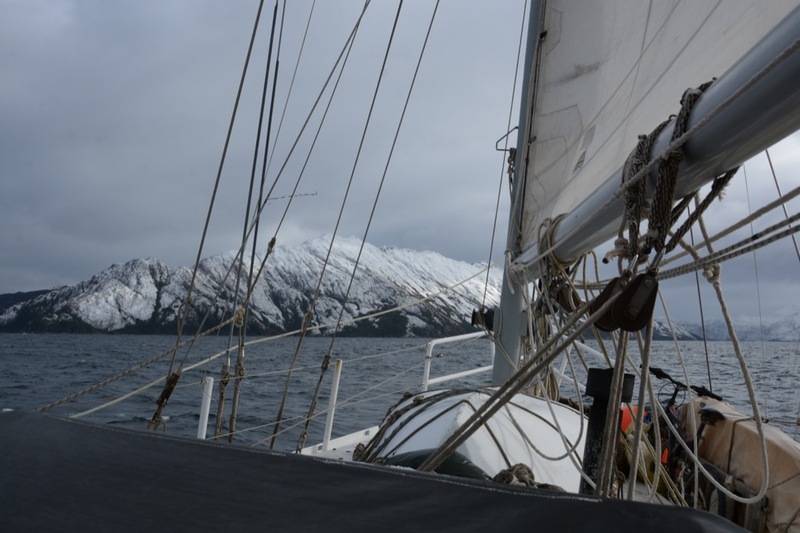 After travelling past the glaciers the explorers came to a wide open sound, and we followed them across it into a channel which FitzRoy named O’Brien. And who was O’Brien? Was he a seaman, pulling at the oars in the whaleboat? No. Seamen didn’t merit a mention in FitzRoy’s account; or at any rate, not by name – not unless they died a violent death (and even then, not usually). 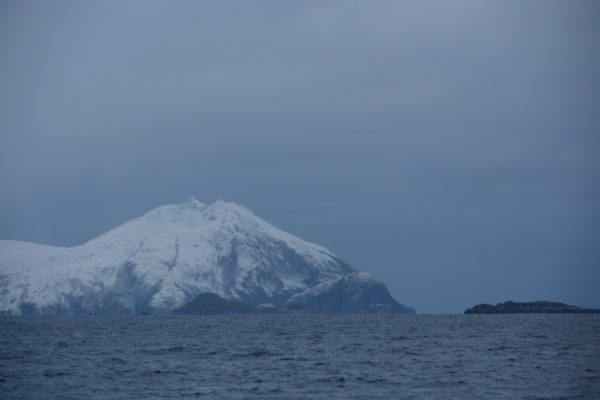 The O’Brien channel and the adjacent island were named by the young captain for his fiancée’s people. During the previous expedition FitzRoy had adorned his chart with the names and titles of his various relations. When they sent him out for a second time, the lords of the Admiralty specifically condemned such frivolity – let the places be known either by their native names or for their features, they ordered – but aristocrats are not particularly accustomed to taking orders. 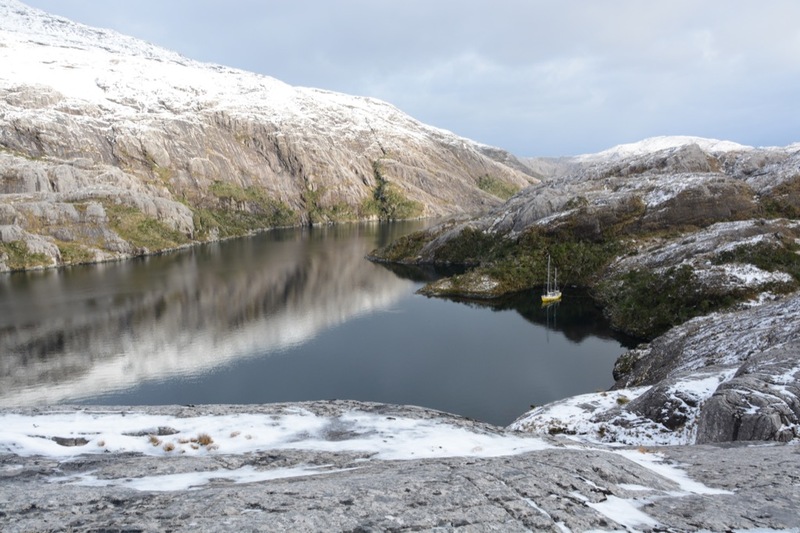 When he reached the end of the O’Brien channel FitzRoy found himself in familiar territory. The expanse of water which opened before him was none other than Whaleboat Sound. On its south side lay the vast island which he had named in memory of his grandfather, the Marquis of Londonderry; a few miles on was the harbour which he had named for his sister, Fanny; and on the far side of the sound lay Basket Island – the place from which the Beagle‘s whaleboat had been stolen three years before. Isla Basket. This stunning island would surely have merited a more descriptive name if it hadn’t been the ‘scene of the crime’ in FitzRoy’s adventures. 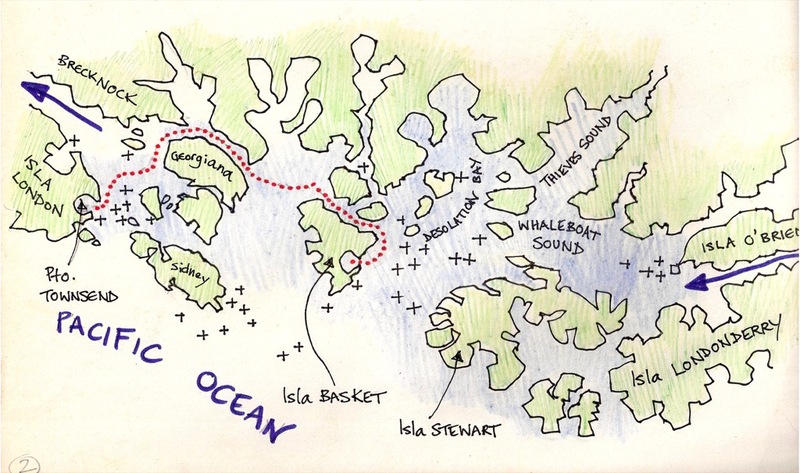 One rainy night, while Murray and his men were camped in the cove just east of the headland, the boat went missing; and thus the explorers had to find another means of returning to the mother-ship. The means which they devised was a coracle, shaped from woven branches and covered with a tarpaulin. 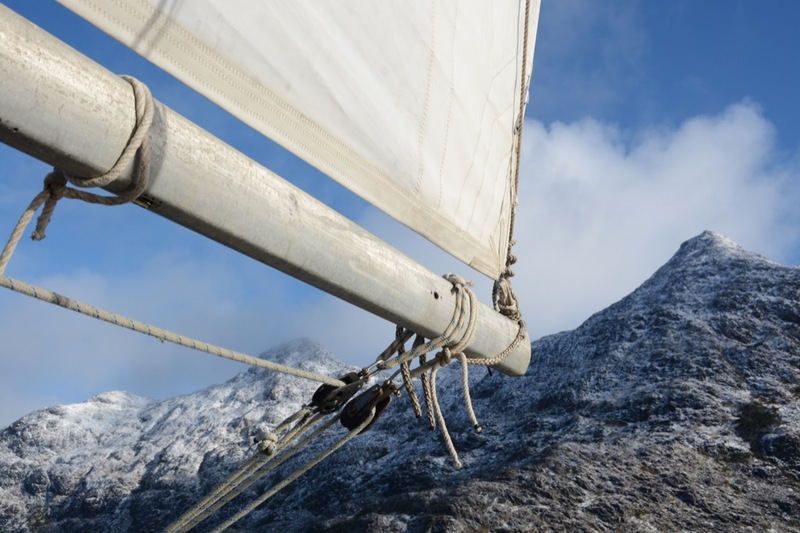 I reckon that most of us, having managed to knock up something of the sort – and having managed to paddle it fifteen miles upwind – would be feeling pretty pleased with ourselves. Murray and his men probably reckoned that they deserved lashings of praise for their ingenuity, but in the event their commander was rather disdainful. He referred to the boat as a basket. Hence, on this occasion the name of the island actually does have a significance. Gazing upon it as we crossed the sound, we recalled the story and tried to re-live, in our mind’s eye, the subsequent events. Re-living historic events is one of my pet hobbies, but on this occasion I found it rather difficult. The story runs thus: No sooner had the ‘basket’ arrived at the mothership and the woeful story been told than FitzRoy sprang into action. 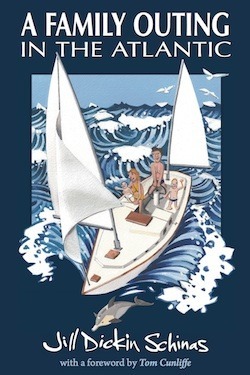 Though it was the middle of the night he ordered the Beagle’s other boat to be provisioned and lowered over the side, and without further ado he set out, with six oarsmen, in search of the missing craft. Having visited the scene of the crime he quickly deduced that the whaleboat must have been stolen, and he soon found plenty of evidence of the theft: Visiting the Yaghan encampments on the northern edge of the sound he found the boat’s leadline, one of her oars, part of her sail, and various other bits of paraphernalia. But of the vessel itself he never found a trace though he spent a fortnight chasing, hither thither, across the broad bay. Sailing the length of Whaleboat Sound in our own little ship, we identified the islets mentioned in FitzRoy’s account and marked on his chart – that was not difficult – but imagining the place peopled by naked ‘savages’, and picturing the open clinker boat bowling along under a well-reefed lugsail or battling upwind under oars – that, I found, was well nigh impossible. The dotted line shows the journey made by the ‘basket’. The fact is that the adventures of these 19th-century sailors must have been unbelievably gruelling. 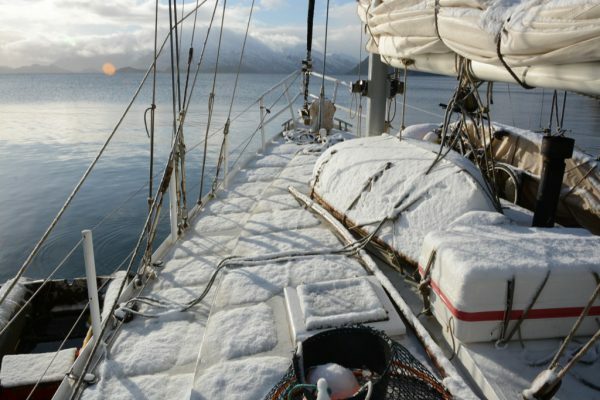 The captain describes how, every day for a fortnight, his crew spent hour upon hour sitting in the boat in sodden clothing. Waves, rolling in from the ocean, smote the vessel as she sailed; and even when the wind was down, and the men were pulling at their oars, the incessant rain and sleet ensured that nobody could stay dry or warm. As it was for the men, so it was also for their captain, too – although, as a well-bred Englishman with a stiff upper lip, FitzRoy makes no mention of his own sufferings. The scenery is dramatic and awe-inspiring – but imagine how it would look to a fellow travelling in a rowing boat. At the close of a hard day’s fruitless searching, the men sometimes struggled for hours to light a fire in order to warm themselves; and their only comfort apart from the fire was a tent improvised from the wet sail. Whereas our jackets and trousers are made of waterproof terylene and our boots of well-insulated rubber, even the best-dressed 19th-century sailor had nothing better than painted canvas and leather to protect him. Picturing the deprivations which these men faced was all too easy, but picturing their willingness to battle on in conditions which, to be frank, would probably kill me – that was beyond my powers of imagination. Just as Fitzroy wondered at the Yaghan’s ability to endure the cold, so we, in turn, marvelled at his; and while marvelling, thus, we also pondered upon the state and fate of the human race: What wimps we have become! Who fancies sleeping in a tent in conditions like this? Not me! 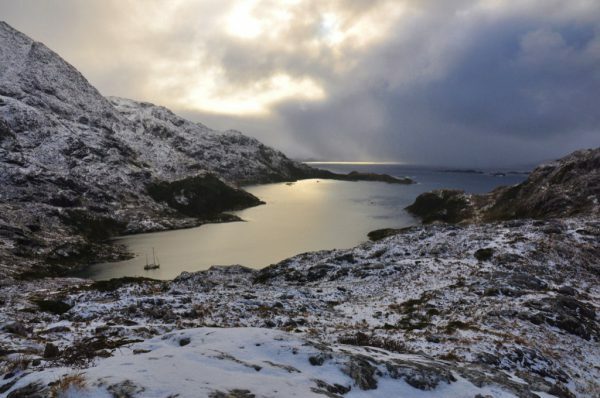 While the young sea captain rushed around searching for his stolen whaleboat, the Beagle was left at anchor in Puerto Townshend, on Isla London. 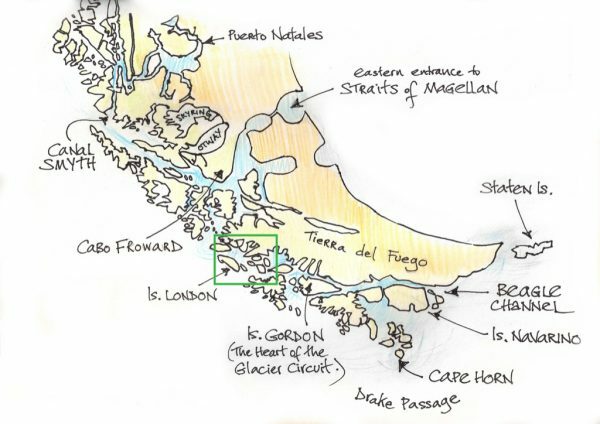 Having dreamed for more than two decades of making this excursion to Tierra del Fuego we have often read FitzRoy’s description of this remote ‘port’, and its position was circled on our chart. Even so – even though it had for so long been our ambition to see the place with our own eyes – I never really believed that we would make it. Entering the cove from the sea would not be too difficult – (supposing that one happened to be passing close along that horribly inhospitable shore) – but in order to gain access from the channel immediately to the north we had to negotiate a narrow pass and battle a fierce current. In the prevailing conditions it took us more than an hour to travel the mile-and-a-half distance – and that was with the aid of the engine! At 90ft, the Beagle will have had no difficulty fitting into coves such as this one, but although she was not so very much bigger than Mollymawk she was a lot less manoeuvrable. Square-rigged and with no engine to help her out, she could not have got into Puerto Townshend from the channels. Continuing westward along the Brecknock channel, we passed beneath the mountain which FitzRoy named St Paul’s. 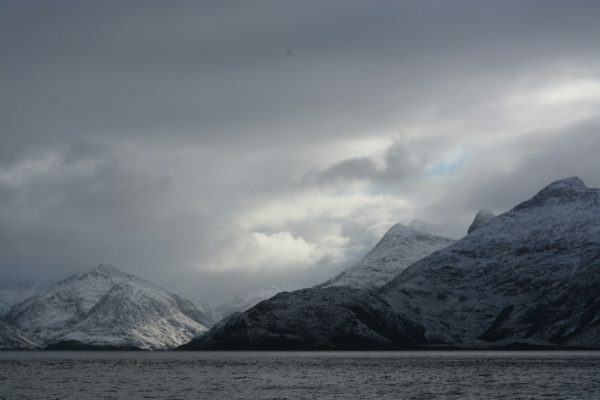 Robert FitzRoy reckoned that that the mountain at the heart of Isla London resembled that city’s famous cathedral. Dusted with a fresh fall of snow, and under a low blanket of grey cloud, the mountains were stark, grim, and austere – but still awesome. The lighting was such that the mountains looked two-dimensional, and the resulting photographs look more like watercolour paintings. I have not enhanced the images. The extraordinary lighting and colour are entirely natural. The fact that the whole vast area is uninhabited makes it seem even more lonely, and, I think, even more magnificent. Somehow, even a small house on the foreshore would have diminished the place; but there was none. 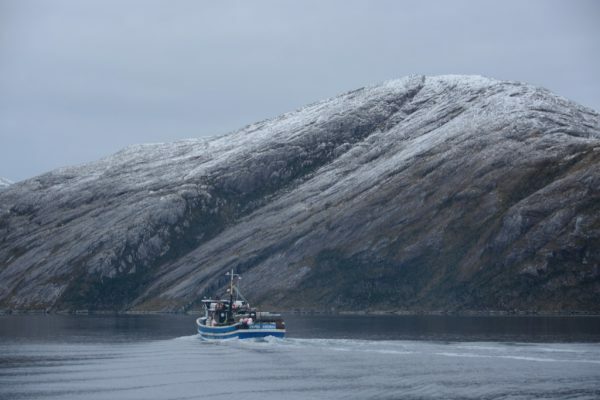 During our travels through the several hundred miles of channels the only people that we glimpsed were a few fishermen passing in their boats. 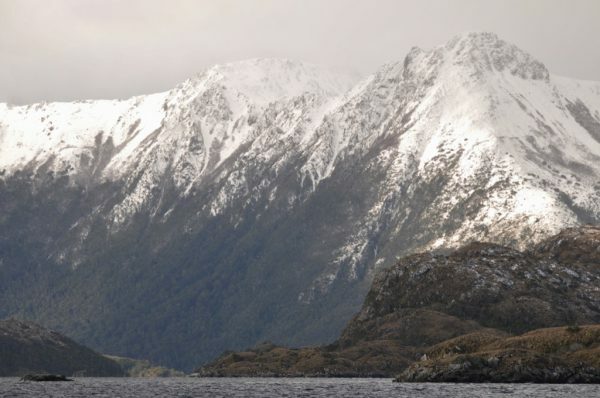 Canal Brecknock leads ultimately into the ocean, and vessels travelling this route – which is the only route between the Beagle Channel and the Magellan Straits – are sometimes obliged to wait for suitable weather in which to nip ‘around the corner’ and into the next stretch of relatively sheltered water. 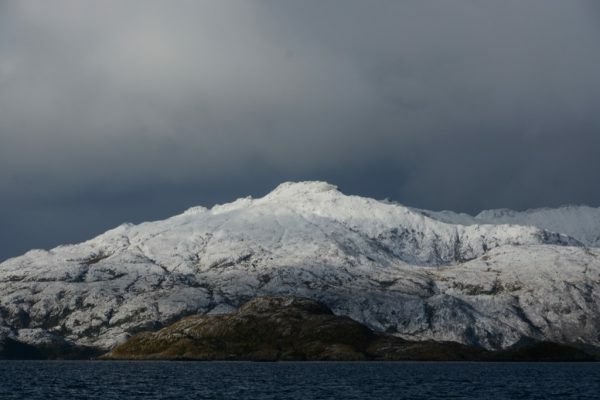 The captain of the ferry which plies between Punta Arenas and Puerto Williams told us that he has sometimes had to wait for a day or more when the seas put up by a hurricane-force wind are too dangerous for his ship. He spoke of 120 knot squalls. We were lucky. Our passage through this region coincided with very light winds. It was hard to believe that the place could ever be a maelstrom of whipped water and williwaws. Moreover, when the weather threatened to take a turn for the worse we could duck into a nearby caleta. Caleta Brecknock. There would be room in here to moor a ship of the Beagle’s size; but she would never have managed to sail up the channel. And in this place our skipper demonstrated – and not for the first time – that he, at least, is quite as tough as was FitzRoy. Indeed, we’re beginning to wonder if he might actually have some Yaghan ancestry. He even washed his hair, by ducking his head into the stream. AAAARGH!!! Just in case you’re wondering – that’s a home-made bar of soap that he’s clutching; so, no nasty chemicals were added to the pristine icy waters of the stream or to the ocean. 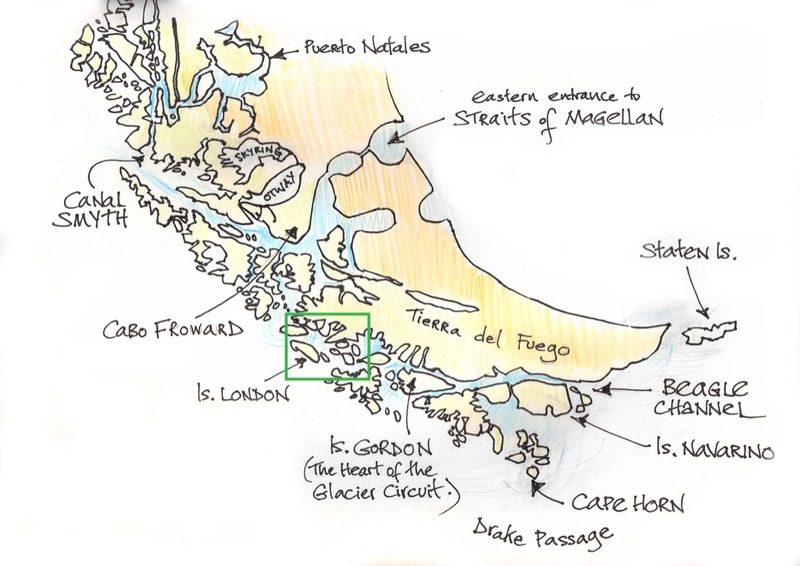 In Part III of this series we enter the Straits of Magellan and learn about their discovery.